Java No Longer Supports XP! On April 8, 2014 Microsoft stopped supporting Windows XP because they need to force people on to other versions of Windows to increase profits. So in other words they gave at least 20% of computer users an ultimatum. Along with an even higher percentage of businesses trying to maintain a budget. They’re clearly kicking themselves in the rear for making XP too good as it was the first version I’ve used that was actually stable! Unless you want a new computer it’s ridiculous to spend nearly $100 for a new operating system when your current one is working great. If Microsoft really wants people to upgrade then offer a low cost or free one because most people won’t upgrade due to monetary limitations. Java is software you probably have installed on your computer. It’s used for online applications barely 0.2% of the time, and it’s often vulnerable to viruses if you aren’t allowed to have the latest updates. 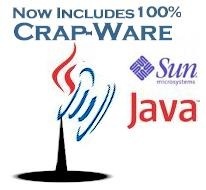 Despite the fact that the vast majority of computer users don’t need Java they’ve decided to alienate the ones who do by disallowing upgrades of their useless software for those using Windows XP. So we recommend uninstalling it no matter what your operating system is because it’s simply worthless, and could be a security risk to your computer! Your best bet for a low cost Microsoft Windows upgrade is probably Ebay if other software companies eventurally force you to upgrade. You can also get a refurbished computer for cheap as well with a later version of Windows. This entry was posted in Microsoft Windows, Software and tagged Java, Operating Systems on January 8, 2015 by Admin.